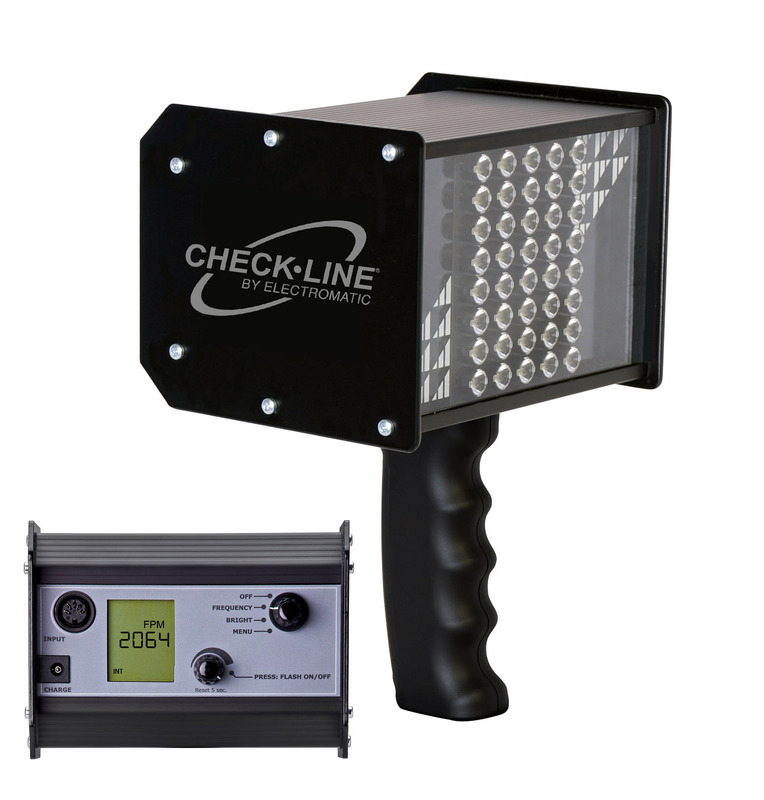 Supplied by the Electromatic Equipment Company, the CHECKLINE® LS-3-LED stroboscope features a super-bright light source and adjustable controls, ideal for process and narrow web inspection in demanding production environments. Forty high-performance LEDs in a 10 x 4 matrix produce a peak brightness of 5000 Lux over an 10” (25cm) wide area. The LS-3-LED can be used as either a fixed-mounted or hand-held stroboscope. The LS-3-LED has a large, backlit LCD with conveniently located control knobs that permit easy adjustment of the flash rate, flash duration, delay and more. The operator can select the optimal balance of brightness and image sharpness for each application. An external input allows syncing the strobe with a remote sensor. The LS-3 LED’s rugged aluminum housing and LED light source make it virtually maintenance free. A convenient tripod mount allows easy installation on a range of equipment. The strobe ships with a universal battery charger (100-240VAC) with USA, Euro and UK plug adapters. A screw on handle, protective rubber bumpers and foam-fitted carrying case are optionally available. Mounting arms are also available for fixed-mounted use.